In order for an author to work on a Workgroup Library you must create the author and associate him or her with a group. You can add an author by clicking on the + button below the author list. When you add an author you will this dialog. 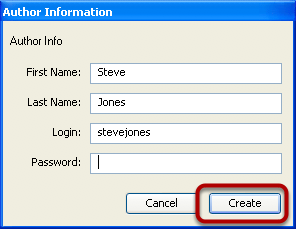 Enter the author information and click Create. Note: If you double-click on an author you will use this dialog to edit the author's information. 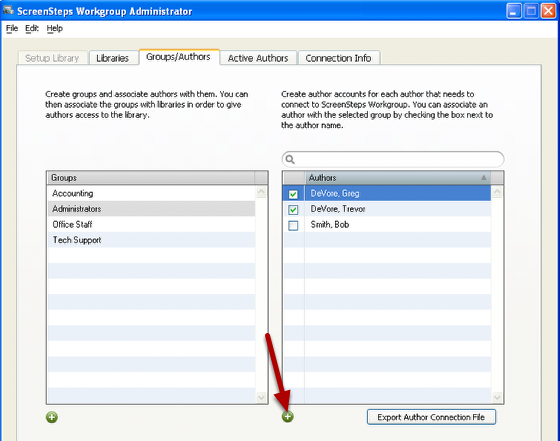 To associate an author with a group select the Group (1) and then check the box next to the author's name (2). The author will then have access to any libraries that the group is associated with.